Arizona Republican Jeff Flake will not seek reelection to the Senate. Arizona Senator Jeff Flake announced Tuesday that he would not seek reelection. The conservative Republican made an emotional speech on the Senate floor, condemning the “coarseness of our leadership” and warning his colleagues in Congress that the Republican Party was “complicit.” Flake has been an outspoken critic of President Donald Trump, though he did not mention the president by name. Brandon Rottinghaus, professor of political science at the University of Houston and author of the book “Inside Texas Politics,” says Flake joins fellow Senator Bob Corker (R-Tennessee) and 17 House Republicans, including one-fourth of the Republican women in the chamber, who have announced their retirements ahead of the 2018 election cycle. “Republicans are worried that they can’t run with Trump, especially if they can’t run against Trump,” Rottinghaus says. Rottinghaus says other Republicans probably share Flake’s sentiments about the president’s modes of discourse, but fear the consequences of speaking out. “Most Republicans have some deep, dark sense that Trump is bad for the party, but can’t say it because we are in a highly polarized part of our nation’s history,” Rottinghaus says. Rottinghaus says Texans have a history of revolting against leaders who aren’t living up to expectations. 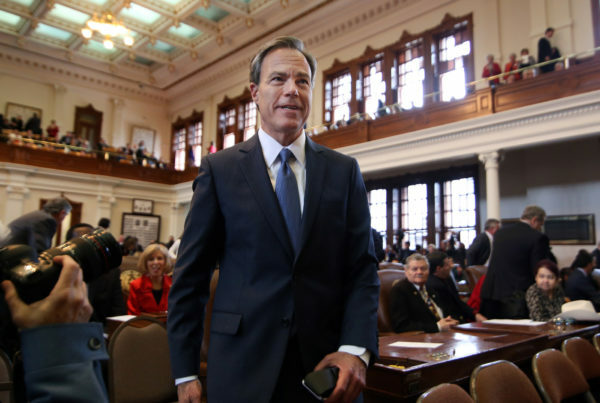 Recent polling, he says, finds Texans cite political corruption and leadership as important issues, with Republicans also listing moral decline as a problem. But the state’s leaders aren’t likely to break with the president. “There’s a kind of Trumpism in play in Texas which is difficult for other opponents to challenge, as well as for other Republicans to run against,” he says. Rottinghaus says the reactionary strain in Arizona politics that likely led Flake to conclude he couldn’t win reelection has a long history – from senator and presidential candidate Barry Goldwater to former Governor Jan Brewer, who championed the state’s “show me your papers” immigration law. But Trump is popular among Texas Republicans, which will probably keep officeholders in his camp.